Susan Szabo was commissioned to paint an acrylic on canvas installation that is 32 feet tall and consists of 9 5-foot canvases. Click the small image to see the complete painting. 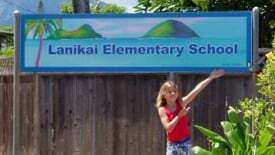 Susan Szabo painted the sign at the entrance to Lanikai Elementary School. Her daughter Kira is standing in front of the sign (Kira attended this school, 2004 – 2006). Susan was one of 50 artists chosen to paint a 6-foot fiberglass gecko as a fund-raiser called “Geckos in Paradise”, to raise money for the Kapiolani Women’s Health Center Cancer Center in Honolulu. Susan’s gecko, named “Kalo Mo’o” (Taro Gecko) was sponsored by American Savings Bank. All art for this fundraiser CD entitled “Hawaii Sings For The Children”, was painted and donated by Susan. All proceeds from the sale of the CD benefit the “Friends of Foster Kids”, to improve the lives of Hawaii’s foster kids. Susan was selected to be the 2001 cover artist for Aloha Airlines’ timetable covers. A new timetable, with a new cover painting was published 4 times through the year! The children’s book entitled “A Beautiful Hawaiian Day”, by renowned singer / songwriter and author, Henry Kapono, is illustrated entirely with paintings by Susan. View illustrations on Susan’s “Book Illustrations” page. Watch the video about the book. She was selected from hundreds of artists to paint the image for Hawaii’s 1998/1999 phone directory covers, with 1.4 million phone books distributed throughout all the islands. See the complete painting on the “Commissioned Work” page. Susan was a feature artist for Hawaiian Airlines multiple times between 1997 to 1999. For these promotions, her paintings appeared on entertainment guide covers and first-class menus and she was profiled in the Hawaiian Airlines in-flight video program.